Context: was reading this when we barely broke even at a sale at a nursery. Never again! So, this is one of those novels for which an understanding of the historical context is essential for a full appreciation of its significance. The era is the early 1850s and Russia stands on the brink of the Crimean War as it manoeuvres to take advantage of weakening Ottoman Empire. Also standing to gain are those who dream of independence from Ottoman oppression. One such is the hero of On the Eve, Insarov, a Bulgarian who, though in Russia, makes forays back to his homeland and is part of a network of nationalists chomping at the bit to be let loose on the retreating Turks. But while Insarov is the hero, he’s not the main focus of the story. Meet Elena, fending off less than suitable suitors while her life slips slowly by. 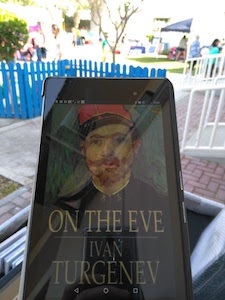 Her world is transfixed after her introduction to Insarov and thus begins a love story which is ignorant of the boundaries of class, politics, familial or national allegiance. While there’s a straightforward and somewhat moving love story here, I found it hard not to read more significance into it. Does Elena represent Russia who should stand up for Bulgaria against her evil but weakening conqueror? Is the fate of Insarov a sign that the coming storm would do nothing to free Bulgaria for anything for more than another 100 years? Is the ending itself symbolic of the mystery we all face when gazing into the future of ourselves and our nations? On one of the hottest days of the summer of 1853, in the shade of a tall lime-tree on the bank of the river Moskva, not far from Kuntsovo, two young men were lying on the grass. Uvar Ivanovitch flourished his fingers and fixed his enigmatical stare into the far distance.